This past weekend was San Diego Comic-Con and, as is the case with many conventions which Viz Media attends, there was a Moon Panel. We didn’t get much in the way of new information at this panel but we did learn that the new voice of Pegasus from Viz’s new dub of Sailor Moon SuperS will be Chris Niosi. Chris Niosi is not only a voice actor but he has also done a great deal of fan and professional animation work. Check out his web site or Twitter feed for more of his stuff. 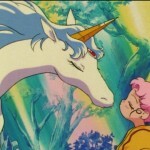 Though nothing about Sailor Moon Crystal was mentioned, with the two movies which will cover the Dream arc having been announced in Japan, it seems only logical that Chris would also provide the voice for Pegasus and Helios once those films are released and ultimately dubbed for North American release. 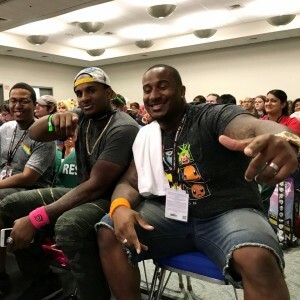 Also of note at the Moon Panel at Comic-Con was an appearance by Mike Daniels, a football player fro the Green Bay Packers. He attended the panel and then posed for photos with some of the staff. 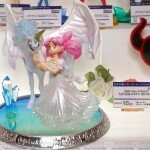 Does a Chibiusa and Pegasus Figuarts Zero statue confirm that more episodes of Sailor Moon Crystal are coming? 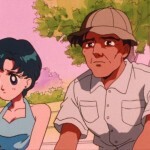 This entry was posted in Sailor Moon Anime (1992) and tagged Chris Niosi, Green Bay Packers, Helios, Mike Daniels, Pegasus, Sailor Moon SuperS, San Diego, San Diego Comic-Con, Viz English Dub by Adam. Bookmark the permalink. Bruh, when i saw Pegasus for a sec i thought “SAILOR MOON CRYSTAL”. At this point, any news is good news, I guess. I’m interested to see the voices of the Amazon Trio and Zirconia. Anything about Sailor Moon S the Movie? Now we just need a timeline of when we’ll be getting the dub of SuperS/Crystal Season III/S the Movie. I expect about ten years seems realistic. And if Chris is still alive/in the business/hasn’t been kidnapped by Columbian rebels and held in a jungle hut eating ants then he might still be the voice of Pegasus. Don’t forget about spontaneous combustion! That’s always a threat! I hope Zirconia will be voiced by Veronica Taylor. She could probably do it. Too bad June Foray passed away last night, she was also a good choice for odd characters like this, though I don’t think she was involved in anime. I know. What a shame. To Aurelia, I wonder when they’ll released Part 1 of Sailor Moon Super S.
RIP. Moose and squirrels everywhere will no longer be the same. I’m sure Fish Eye will be kept male, but it’s also possible he will be agender/genderless, since I almost feel that’s what they were going for to begin with. Either way, he is my favorite member of the Amazon Trio, (mainly due to his water connection and blue colors). I’m getting fed up with no archives of August. When are they ever gonna make it? I would like Roger Craig Smith, Max Mittelman, and Lucien Dodge to be the Amazon Trio. 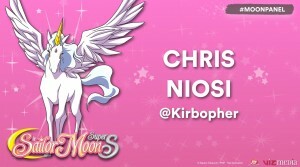 And I would like Travis Willingham to be Chibiusa’s friend, Kyusuke. What? No Vince Mignogna for one of them? Hmm, I never thought of that. To be honest, he seems like a good fit for Pegasus, too. You know, for some reason, when I picture Zirconia and the new English voice, for some odd reason, I’d imagine they’d pull a Frieza on the dubbing. I don’t know why, I just do. I pictured Barbara Goodson as Zirconia for some reason. Her voice would mostly be compared to her Rita Repulsa role from Power Rangers. I doubt it. But I would say Veronica Taylor would be a perfect fit. Sailor Moon Pops series 2 are available for preorder now!! Big news: there’s a clip of Sailor Moon Crystal with dubbed audio being advertised on the net. And at the end, the text says it’ll be released this holiday season. Which leaves one question: when will it hit Hulu? I saw that. Good to have confirmation. Also, I feel like the dubbed voices once again match Crystal characters better than they did in SM classic from Viz. Good news! They just announced the voice actors for the Amazon Trio! Fish Eye will be voiced by a male voice actor! I read it off Facebook on Viz’s page and on Erik Scott Kimerer’s Twitter page. Kimerer will be Fish Eye. Now all’s left is the Amazoness Quartet, Zirconia, Queen Nehellenia, and Kyusuke. I also hope Veronica Taylor will voice Zirconia. Oh good I’ll scope that out!